(Bloomberg) -- Wherever you look in developed markets, sovereign bond yields are at their lowest levels in years as traders ratchet up bets that major central banks will be easing. Yields in Australia and New Zealand dropped to record lows after a closely-watched part of the U.S. curve inverted on Friday as investors wager that the Federal Reserve will need to cut rates. Trading volumes in Treasury futures were double the norm during Asian trading, while Japan’s 10-year yields fell to the lowest since 2016. Money markets are pricing around a 90 percent chance that the Federal Reserve will cut rates by 25 basis points by December, followed by another reduction in September 2020. This comes after the central bank projected no hikes this year at its policy meeting last week. It’s difficult to see “strong inflationary pressures” in the economy, Chicago Fed President Charles Evans said in Hong Kong Monday, adding that the central bank will be monitoring data very closely. Open interest, a measure of outstanding positions across Treasury bond futures, jumped Friday as the yields on the 10-year cash bond dropped 10 basis points to 2.44 percent. Hedge funds and other speculators have also cut shorts in 10-year futures after holding record positions as recently as September, according to the latest Commodity Futures Trading Commission data. Australia’s 10-year bond yields fell five basis points to 1.78 percent. New Zealand’s dropped as much as 8 basis points to 1.899 percent, a record low in data compiled by Bloomberg since 1985. In Japan, the benchmark fell 2 basis points to minus 0.084 percent. Yields on German debt fell below zero for the first time since 2016 Friday after weak factory data. Still, confidence among German firms unexpectedly improved this month, according to the Ifo. 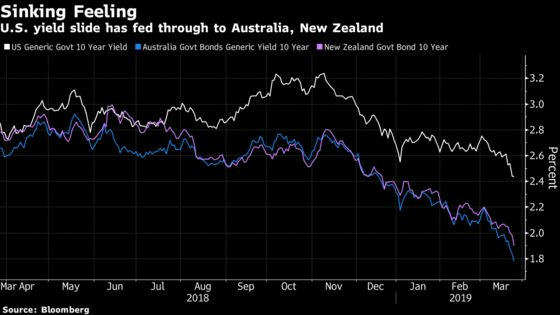 Australian bonds have rallied since central bank Governor Philip Lowe pivoted to a neutral stance last month from a long-held view the next move in rates would be up. The local yield curve flattened further, with the difference between three and 10-years narrowing by two basis points to 38 basis points. The flight to safety is spurring sell-offs in some parts of emerging Asia. 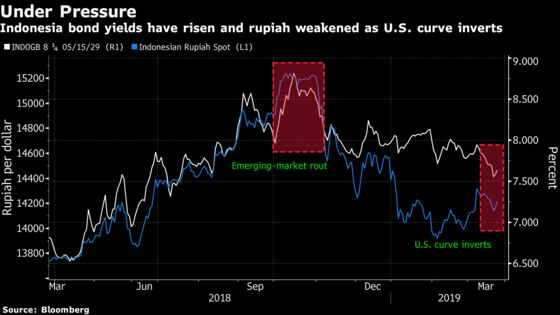 Yields on Indonesian debt due in 10 years climbed six basis points to 7.67 percent as investors ditch high-beta assets. 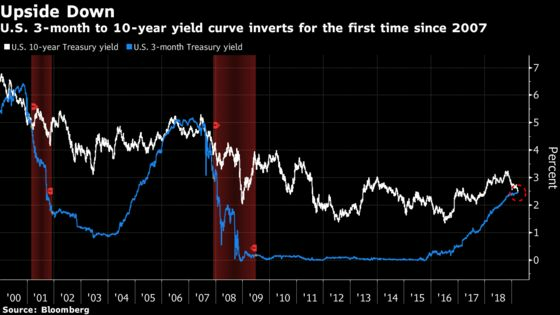 The inverted yield curve in the world’s biggest bond market is sending a negative signal for developing-nation assets, according to Win Thin, global head of currency strategy at Brown Brothers Harriman & Co. in New York.